This month's Ipsy bag was pretty interesting. Not only is the bag itself amazingly cute, but I also received a product in my February bag that I have wanted to try for so long. Win! Pure Brazilian Deep Conditioning Masque: This nutrient rich hair masque contains keratin, acai, and cocoa seed butter which help moisturize, smooth hair shaft, and reduce frizz. I love trying hair treatments, and I can't wait to try this one. Pefect Formula Pink Gel Coat: This highly raved about nail treatment has always been on my must-try list, so I was really happy to see it included in my bag. This gel coat helps strengthen and protect natural nails, thanks to it's protein rich coating. It contains a hint of pink and an optical brightener that give nails a rosy glow and a healthy looking appearance. It also helps hide any yellow discoloration, and dries quickly to a super glossy finish. I am loving this so far. My nails really do look and feel healthier when I apply one coat of this treatment on them. Smashbox Cosmetics Photo Finish Primer Oil: When it comes to primers, Smashbox gets it right. New to their extensive lineup of primers is the Photo Finish Primer Oil. This oil-which contains a blend of 15 essential and lipid rich plant oils, not only creates the perfect radiant looking canvas for makeup, it also helps reduce the appearance of fine lines, and increases skin's moisture with prolonged use. I have recently been appreciating the benefits of face oils, so this product couldn't have arrived at a better time. Very excited to give this one a go. Vintage by Jessica Liebeskind Sparkling Lip Gloss in Pink Sequin: To be honest, I didn't think I would like this lip gloss. Reason being-sparkle overload. But it's actually not all that bad. The shimmers in this sheer gloss pop beautifully on bare lips, or atop another lip color. It feels comfortable on, it's not overly sticky, and it's long wearing. This even gives my lips a fuller appearance, which I am not mad at. 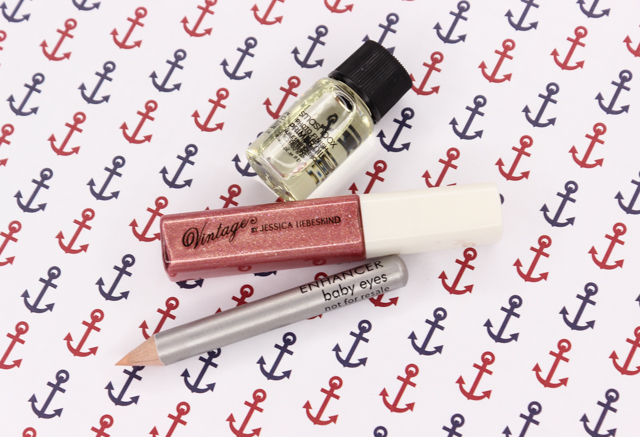 Paula Dorf Baby Eyes Enhancer: This eye pencil is a dream for lining the lower waterline. Doing so gives the eyes an overall brighter and bigger appearance. The flesh hue is super flattering since it doesn't look stark on the eyes, like a white eye pencil may look. Love this! What did you all think of February's Ipsy bag? That's a pretty good bag. This was definitely a nice bag, LaNeshe!